US and Iraqi soldiers have arrested at least 108 suspected insurgents in a series of raids south of Baghdad, the US military says. 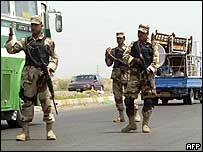 The raids were undertaken as part of Operation Lightning, a series of security operations around the capital. Officials in Iraq also say they have arrested a militant leader suspected of involvement in many violent attacks. Officials said the man, known as Mullah Mahdi, was captured during a raid in the northern city of Mosul. They said at least five others were arrested in the same operation, including Mullah Mahdi's brother. Mullah Mahdi was suspected of being a leader of the militant Islamist group, the Army of Ansar al-Sunna. US and Iraqi troops recovered dozens of artefacts of "historical importance" taken from Baghdad's National Museum following the US-led invasion, the AFP news agency reported. Operation Lightning follows an upsurge in insurgent attacks, which have killed more than 600 in the past month. Saturday's raids took place around the town of Latifiya, in a lawless area known as the "triangle of death". Over the past four days of the operation, the Iraqi interior ministry says more than 700 people have been arrested, the Associated Press news agency reported. They also say they have discovered 50 weapons and ammunitions caches in Anbar province, west of Baghdad. Among those was a large complex of recently used underground living quarters with air conditioning and high-tech equipment, the AP news agency reported. Some of the rooms were filled with weapons including "numerous types of machine guns, ordnance, including mortars, rockets and artillery rounds, black uniforms, ski masks, compasses, log books, night-vision goggles, and fully charged cell phones".